I have seen the zombie apocalypse, survived and turned right back around into the fray, yet I still feel the hunger for more. 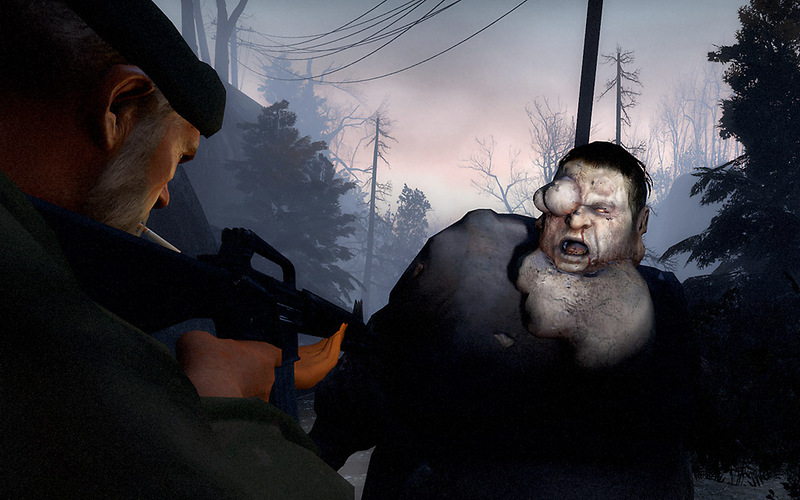 Left 4 Dead is a co-op, survival horror, first person shooter for the Xbox 360 and Windows PC platforms. Left 4 Dead thrusts you, one of four survivors, into the middle of a pandemic of epic proportions, pitting the survivors against hordes of zombies as you fight for your life on the way to the escape zone. The action is fast paced and nonstop, as hundreds of zombies rush you from every direction. As one of the four survivors, you and your teammates must fight for your lives as you make your way through various situations to reach the “Safe Rooms” which break up each story into four sections where you can gather up more ammo (there’s plenty of it in the game) and health. The enemies are angry, fast, very vicious and plentiful. There’s also a little bit of variety in what zombies you encounter. There’s your typical drone type, The Boomer who spews vomit all over the players and explodes, calling in a zombie horde. The Hunters who stick to the shadows mostly and jump at you, knocking you down as they begin to ravage your body. Smokers who have long tongues that act as tentacles. Witches who are very strong and very fast (try to avoid them at all cost) and my favorite, the Tank. He’s huge, and strong and takes a massive amount of damage before he falls. While I enjoyed the single player campaign, it was lacking something for me. After I thought about it a little, it came to me. I went through every scenario in less than four hours. For me, four hours just isn’t enough. However, at the request of some friends, I logged online to give the multiplayer a shot. This is where the real fun begins. Online you play in a 4-on-4 co-op match in one of two scenarios (yes, there are only two levels) where you get to be a member of the horde - i.e. one of the above mentioned special zombies or the survivors. After each section, you switch sides. The scoring is based on your ability to survive the horde or kill the survivors. The fun to be had here is astounding. The only time I spawned as the Tank, I single handedly wiped out three of the four survivors for the big win. It is disappointing to know that there are only two levels to be played online, however I kept going back for more and can rest easy knowing that Valve is working hard at releasing new maps for our consumption. All in all this is a good new series. The mostly lackluster single player campaign hurts it a little but the online experience is a lot of fun. They just need to hurry up and get some new maps out because my trigger finger is itchin' for some more zombie action.